This week Sadie has been especially passionate about her favorite subject. I've found her whispering the story of various saints to herself (especially Saint Bernadette and Saint Therese), and she's been wearing her little Carmelite habit, although last night she was able to be convinced to wear pajamas rather than insisting on sleeping in it (I draw the line at taking the cape and veil into bed with her too...). "Patrick, do you want to be a Bishop?" has become regular mealtime conversation, since she sits right next to him and even on our days off from school it's likely at least an hour is going to be devoted to reading from the lives of the saints which she'll haul over to me the second my backside hits a couch cushion (Nursing Patrick? Here. Read this. Aloud.). We've also been talking a lot about the Eucharist. Whenever we talked about it she would get strangely quiet so I was never even entirely sure if she was listening, much less understood what I was saying. 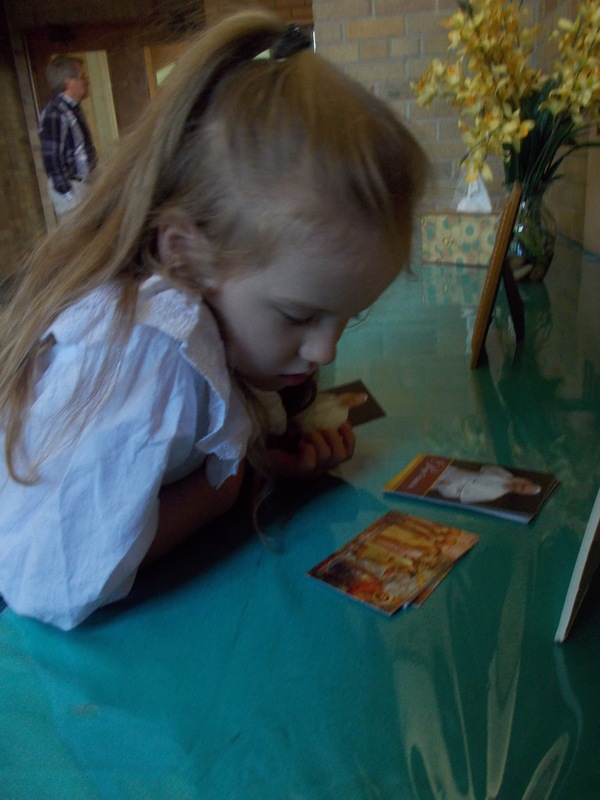 This week she pointed at the Eucharist in one of her books and said "That's Jesus, right? And at Mass last Sunday during the consecration, the bells rang out and I heard a small whisper beside me say: "I love you God. I always want to please you." Me: "Could you put on a dance performance for me and Mae and Patrick?" Me: "Was that a curtsy?" Sadie: "Actually no Mommy, it wasn't. I was bowing low before God the Father, the Almighty." A few minutes later she bows again. Sadie: "Did you see me bow? I was bowing before the most Blessed Trinity. I was saying: I will serve you God." So... She's been in fine form this week... now to get her ready for swim lessons. Amazed at her devotion at such a young age! Yes! I am amazed too! Please tell me how you first started to encourage such devotion!